Three years ago, car designer Olivier Gamiette became fascinated with how watches work and began drawing them in his spare time. He started to educate himself on the different elements that watches possess and how to define their proportions. His goal was to not only draw credible and realistic watches, but also to have them tell time in ways he had never seen before. 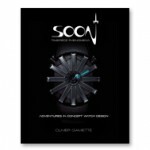 Thirty-four extraordinary concept watch designs later, SOON presents Gamiette’s creations in all their glory. Meet Sentinelle with its six rotating glass cylinders, the futuristic Celerity with horn-like propellers, and Sublissime with its mesmerizing crisscrossing bands. Discover these timepieces and the magic each one holds through Gamiette’s thoughtful watch descriptions, in-depth design tutorials, and, above all, his conceptual masterpieces. Categories: artist series, Books. Tag: Olivier Gamiette.